Hi there! My name is Rechelle from the Philippines. To be honest I am a beginner in this field but I am in search of new and challenging responsibilities in order to keep on my...Read moreHi there! My name is Rechelle from the Philippines. 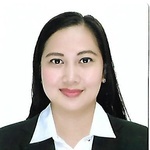 To be honest I am a beginner in this field but I am in search of new and challenging responsibilities in order to keep on my career path and desire to set up an excellent working relationship to all of the employers. I want to learn new things which I think I can excel.